Last Saturday, we took a mini tour of the Cotswolds region, a beautiful rural area of southwestern England dotted with picturesque towns. 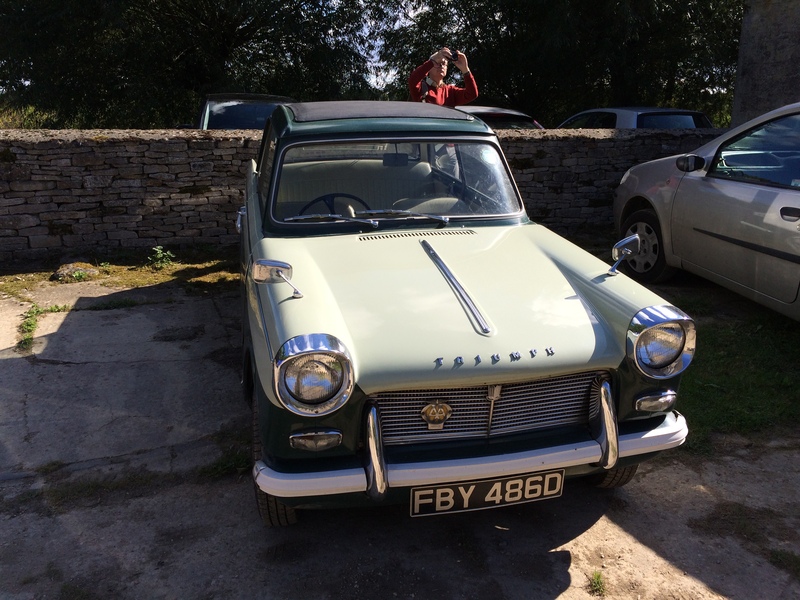 We spent a week in one of those towns, Fairford, which is very friendly and beautiful. On Saturday, our friends, Charlie and Avril, who live in Broughton Poggs, picked us up and took us out for the day. The first stop was in Lechlade, a town between Fairford and Broughton Poggs. 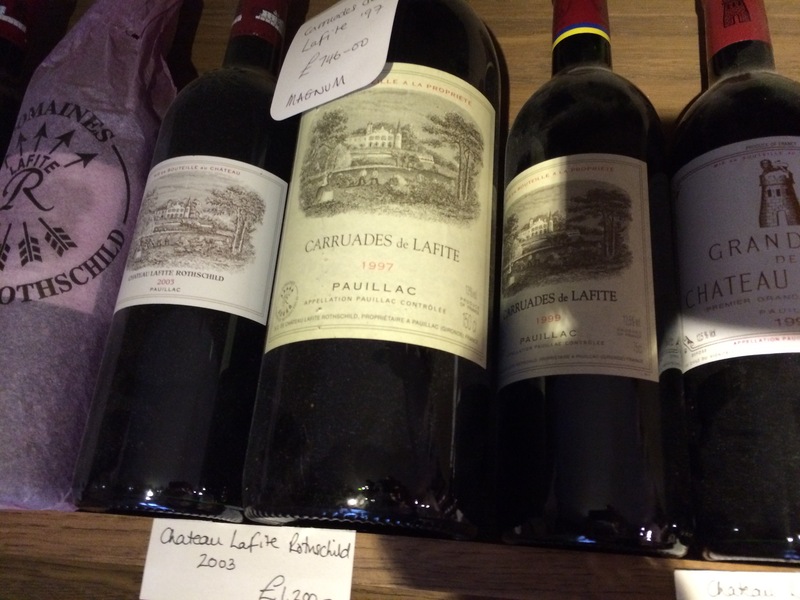 While Dorianne and Charlie went to the store, I spied a little wine shop called Vin Est . . .; I told them to stop on their way back and pick me up. The Vin Est . 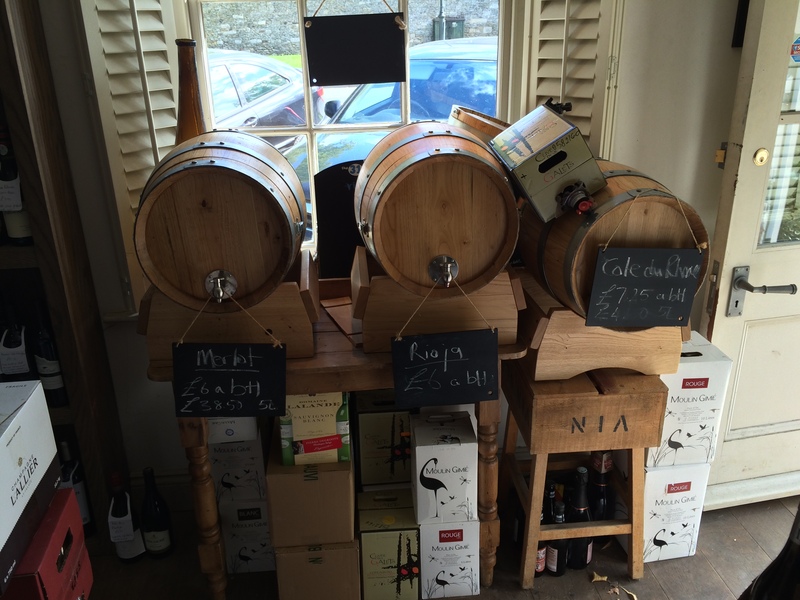 . . shop (LINK) is very small, a front room stocked with wines on shelves, in bins, on tables, and three casks for those who want to bring their own container. In the back are a couple of more rooms, one empty on this visit – about to become a beer room and to be used for tastings, and a smaller room where the premium wines are kept. 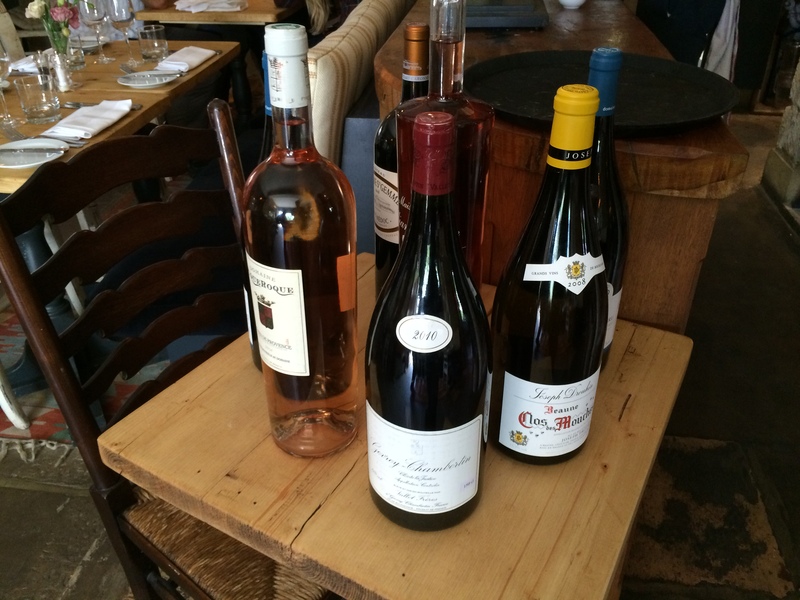 They also distribute wines to a number of restaurants and pubs in the area. Some of the Good Stuff. 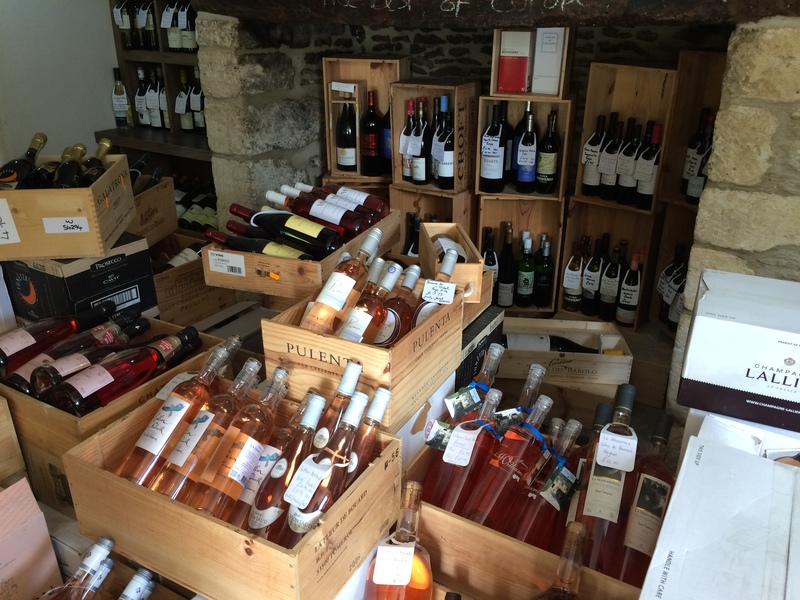 Nice Wine Shop in Lechlade. I spoke with Rachel Jenkins, who owns the place with her husband Mike. 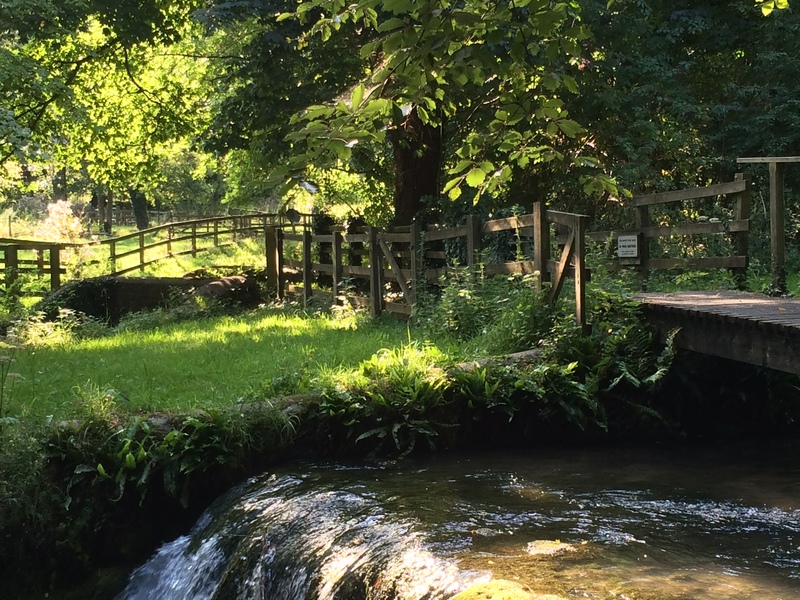 They moved out from London to this idyllic spot and noticed a hole where a premium wine shop should be. The shop is inviting and intimate, and the Jenkins’ know their wine. 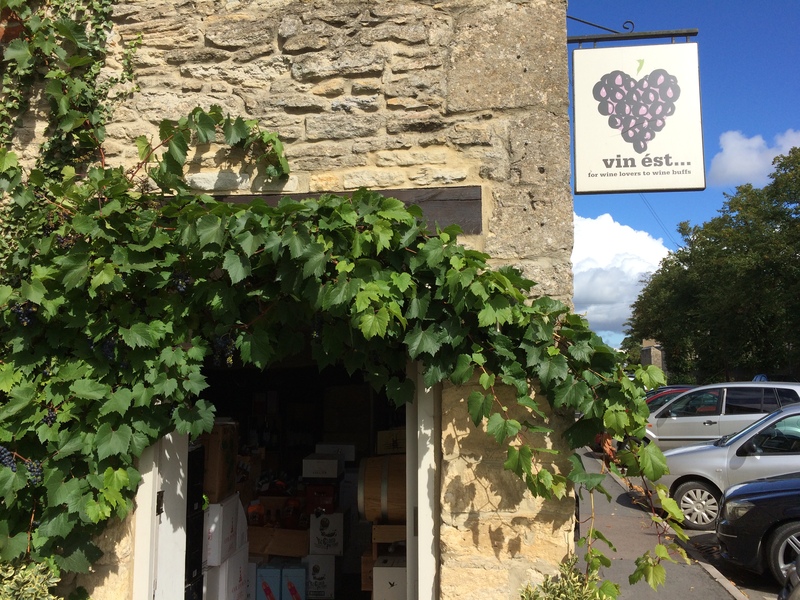 If you are in the area sometime, this is the go-to wine shop once you get away from Oxford. I bought a nice bottle of Pouilly Gris that is sitting comfortably in the fridge now. Back in the car to Charlie and Avril’s beautiful home in Broughton Poggs. A cup of tea or coffee and some conversation, then we are off to The Plough Inn (LINK) in Kelmscott for a hearty lunch. Sauvignon Blanc for Dorianne, grapefruit soda for Avril, and the local Buttcombe Bitters for Charlie and me. Great food in a really nice spot – and you can book a room if you like. Then a walk down the lane to Kelmscott Manor (LINK), the former home of the great arts and crafts movement’s William Morris and his family. 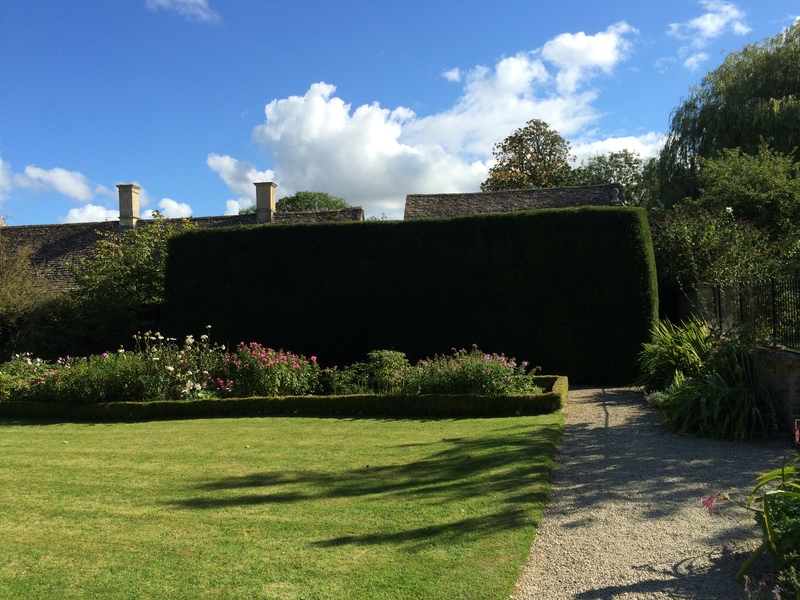 After a tour of the stately home and grounds, we headed back to Broughton Poggs, where we examined a very old stone barn that Charlie and Avril are reconditioning into a home. A remarkable transformation is done with these old buildings, keeping the historic charm while remaking them with all the current conveniences. Then to their home, which is in a converted 15th Century mill, with about an acre plus of gardens on the property – truly a remarkable place. 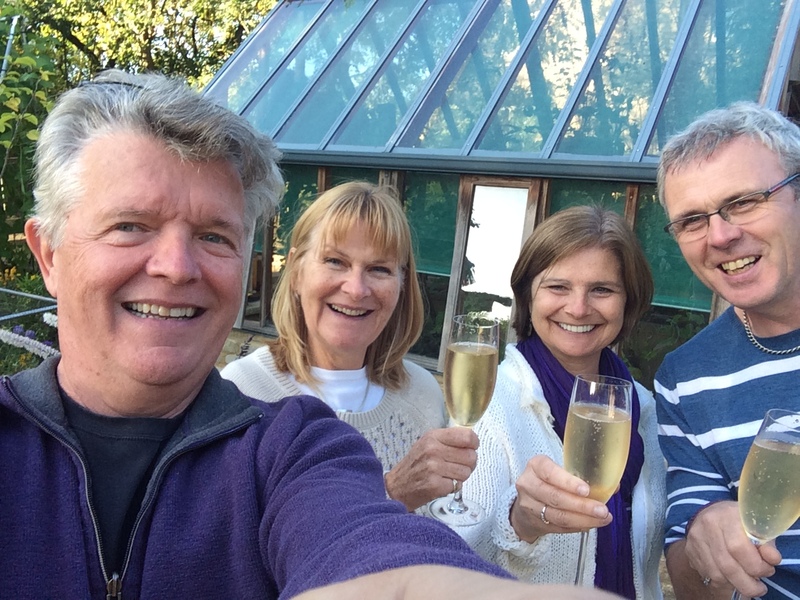 We toured the gardens with a nice glass of Crémant (my fault in not noting the maker) from near Macon in France. 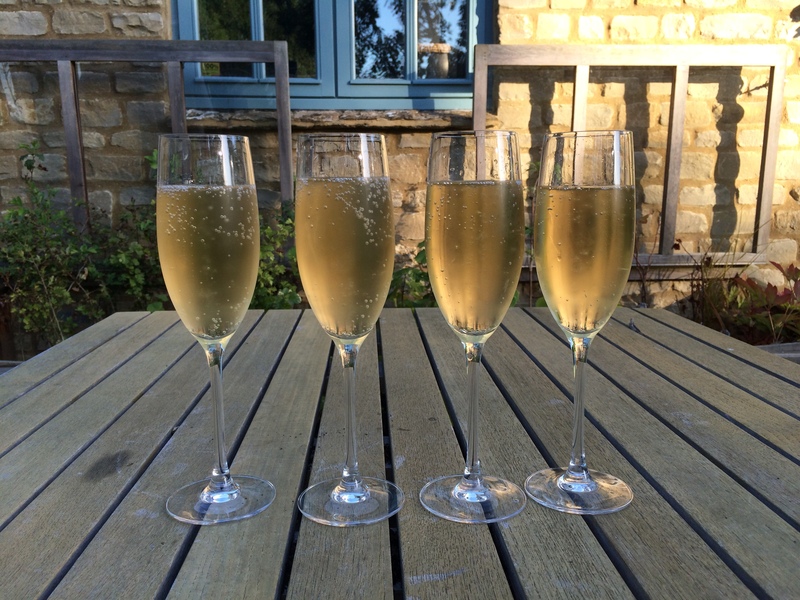 Glasses of Crémant for our Garden tour. Jim, Avril, Dorianne and Charlie. Well into a Very Good Day. Then more tea and conversation before heading out to dinner at The Five Alls (LINK), a pub about 50 meters from Charlie and Avril’s home. 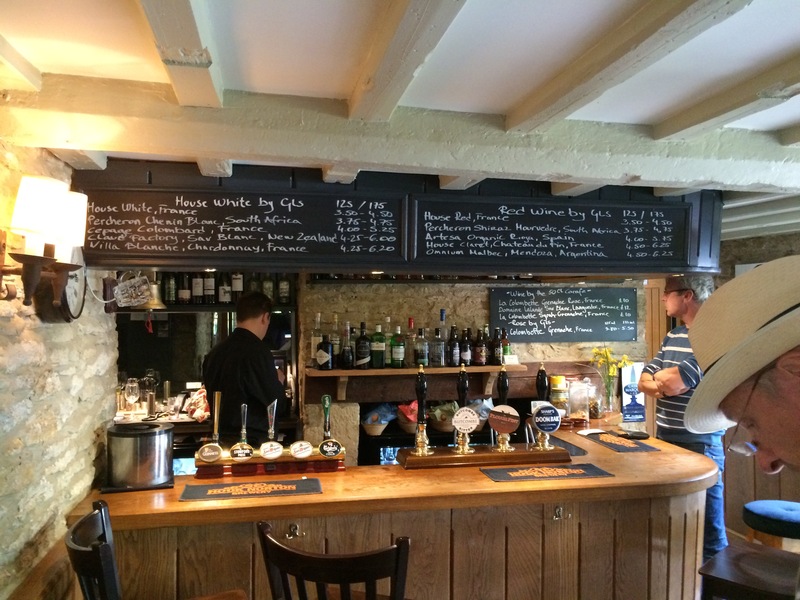 The same management as The Plough Inn, it is a nicely appointed pub with a barroom and several dining rooms. 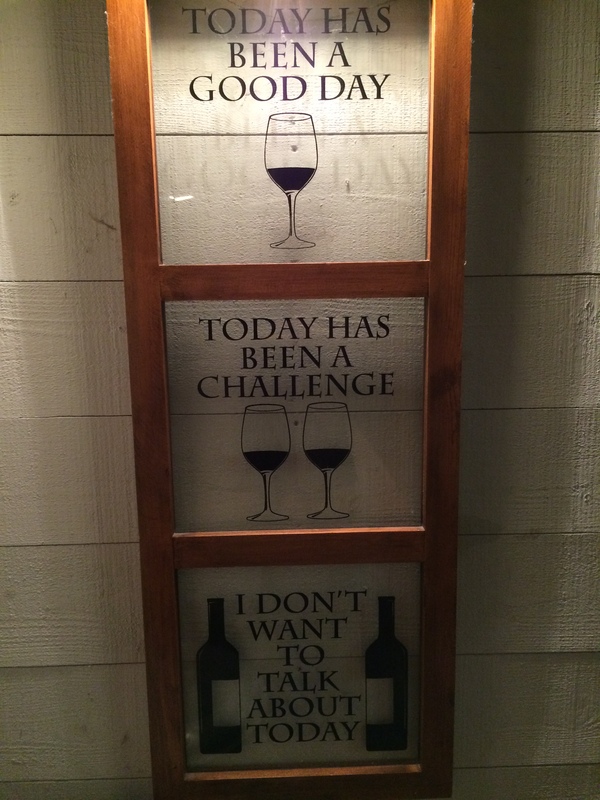 We were seated in short order and I perused the menu and the wine list. The list is interesting, mostly French, of course, but with a number of New World wines from South Africa, New Zealand, Chile, and Argentina. And, the wines are sourced thought our friends at Vin Est . . ., mentioned earlier. The only U.S. wine is a (cringe) White Zinfandel. But, we’re in England after all. 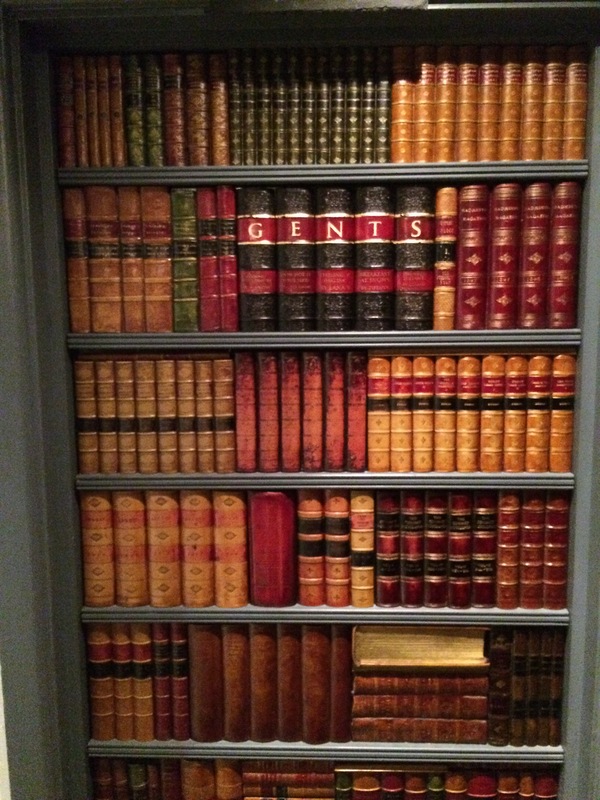 Door to the Gents Room at The Five Alls. 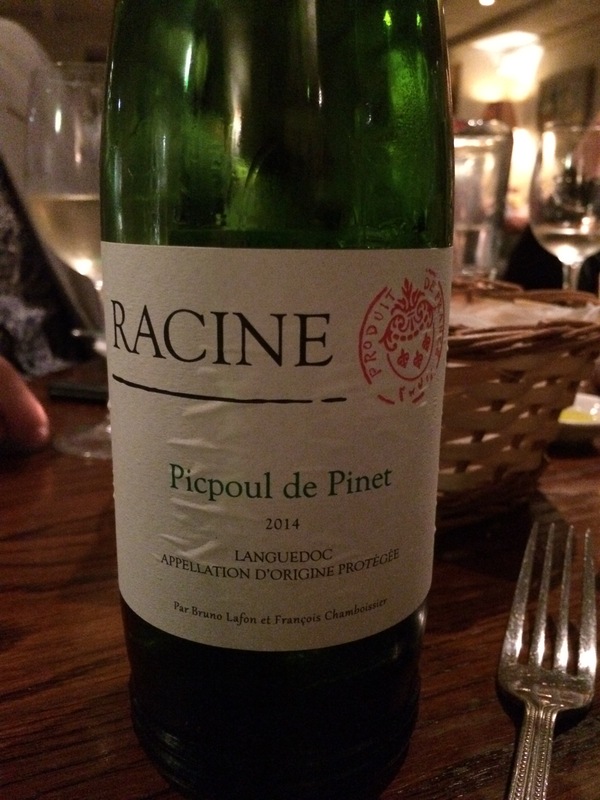 Charlie asked me to select the wines, so I chose a 2014 Picpoul de Pinet from Racine (LINK) in the Languedoc, France. Charlie cringed a bit at my choice, noting that the Picpouls had been pushed in England as an alternative to Pinot Grigio and that he found most of them lacking in any complexity. So we would see. 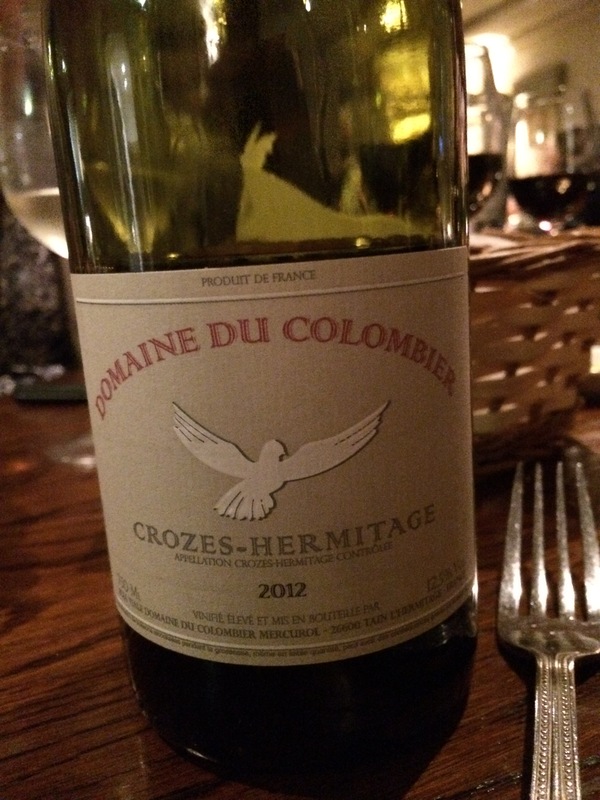 At the same time, I also ordered a 2012 Crozes-Hermitage from Domaine du Colombier (LINK), to go with the venison that we had all chosen for our main course. This rich Syrah with a peppery, dark fruit, favor and good structure proved a success with the venison. I had asked that the second wine be decanted when I ordered it, however, this did not happen, so it took some time to open up nicely. But back to the Picpoul de Pinet. When it arrived, I was wondering if Charlie would be right, and we would be getting a vin ordinaire with little to no character. Right off the bat, it had a strong minerality on the nose, with hints of pear, citrus and lemongrass – similar, except for the heavy minerality to a New Zealand Sauvingnon Blanc. The taste was strongly earthy with hints of floral notes, pear, and a saltiness around the edges. It opened up a bit more after about ten minutes in the glass – it smoothed out and the complexity showed through. Charlie approved. This is a beautiful region, becoming more gentrified by the minute due to its proximity to London, but retaining much of its charm – and getting some very good restaurants in the bargain. We have thus far not had an English wine – we plan to do that next week in London, but we have stuck pretty much with the French, with a couple of forays into South America and New Zealand at the supermarket. I would love to hear comments about your wine experiences in the U.K., and any recommendations for London would be appreciated as well.